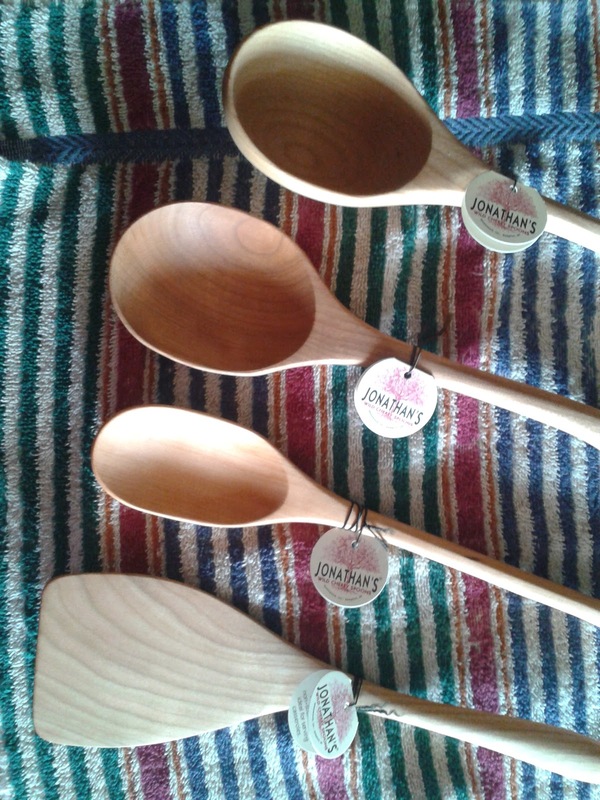 From the signature Lazy Spoon to servers, ladles and tongs.. Jonathan's Wild Cherry Spoons are a work of art! 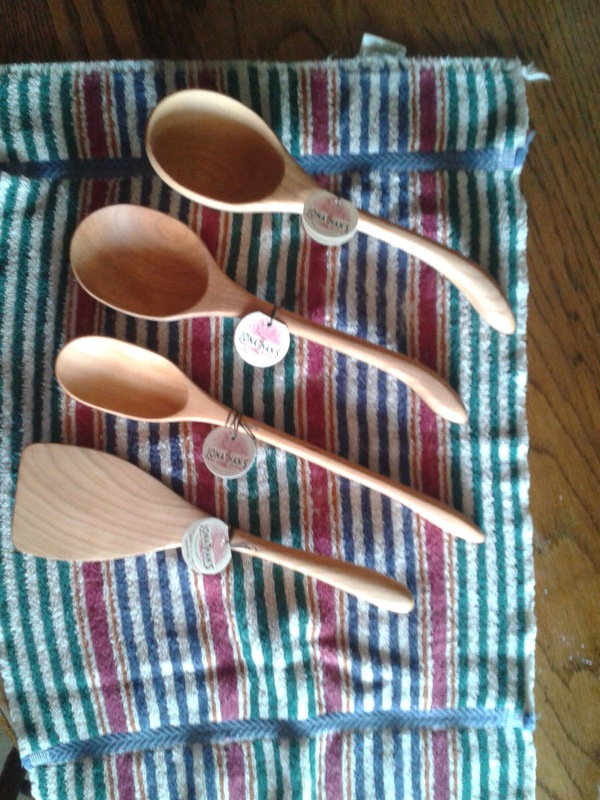 Beautifully handcrafted utensils from stunning cherry wood. These are not your typical wooden spoons. They will adorn your kitchen in their beauty, but so practical for use. The cherry wood is a light weight, durable wood that is going to allow you to use the utensils for years to come. Light weight for mixing, stirring, serving. The handle is curved for easy gripping. The ladle offers a perfect serving size amount. All hand crafted in PA! "My spoons have developed over the years. Originally made of uncommon spoon woods such as lilac, plum, and honeysuckle, I have since chosen to make my spoons of cherry wood. This is a hardwood with handsome color and grain, durable, smooth, and strong. My utensils have a unique sense of balance and warmth because they are designed with the hand and purpose in mind. "Spoons" have become spatulas, tongs, spaghetti forks, spreaders, and more. Today I offer a natural cherry finish, a flame-blackened surface with a sanded edge to reveal an accent of warm cherry wood, as well as flame-blackened stripes and spots. My collection of handcrafted cherry wood utensils has evolved over 30 years of experimentation in the woodshop and kitchen. These spoons can serve anything, from soup to spaghetti, pudding to pie; they can spread, scoop, strain, whisk, ladle, grab, cut, peel, paddle, or pour. Use them at the stove or on the table." Wood is the natural utensil, utilized for generations before us. Practical yet beautiful, those are the type of instruments I love to use in my home. The Lazy Spoon is unique in that it has a notch along the handle, to hook on the side of the pan. No more having to search for your spoon at the bottom of the kettle! Much more than just spoons, Jonathan has created every utensil you would need in the kitchen! Take a look at some of these works of art, the pictures will show much more the creativity than my words will express. 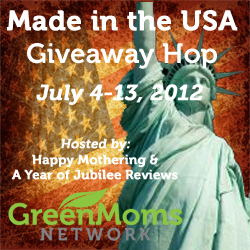 Jonathan is one of the sponsors in the Made in the USA blog hop event beginning July 4th. Be sure to stop by then for your chance to win a 4 piece collection from this beautiful designer! The cherry wood is beautiful! I really love the ladles. Love these wooden kitchen utensils! I use many of them in my kitchen. Need to update to new ones! 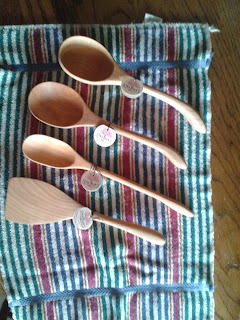 Oo, those are nice :) I love wooden utensils too and the cherry wood has such a great color to it. Wow these are absolutely beautiful! These would make cooking even more fun and serving a pleasure! These wooden utensils are amazing! These are beautiful. 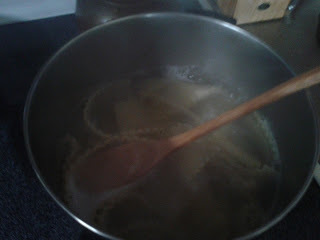 I really need that pot strainer. Very nice. I would LOVE to win this! How do I enter? I love the lazy spoon. That notch is perfect for me because I am always getting the spoon out of the pot with another spoon. Their products are so pretty and useful. love all the shapes and colors of wood they use..great site...thanks for sharing it with us! I desperately need a new wooden spoon - my husband accidentally put mine in the dishwasher too many times, and it started to crack and splinter. I miss it - these look so beautiful, he couldn't help but remember to hand wash them! these are absolutely gorgeous! i love the salad tongs- they definitely are works of art! the care he puts into his work is apparent- i would love to have a kitchen filled with these beautiful, artful utensils! thanks so much for the review! these are so gorgeous! i love the lazy spoon! I love the look of the lazy spoon, and it's a neat idea.